We're really, really good at events. We have a background in corporate hospitality, social functions, trade shows and large-scale consumer events. Our friendly staff will happily interact with your attendees, teach visitors how to build big bricks, share our expertise as we live-build a model in from of them or help them have an amazing experience with 10s of 1,000s of LEGO bricks. 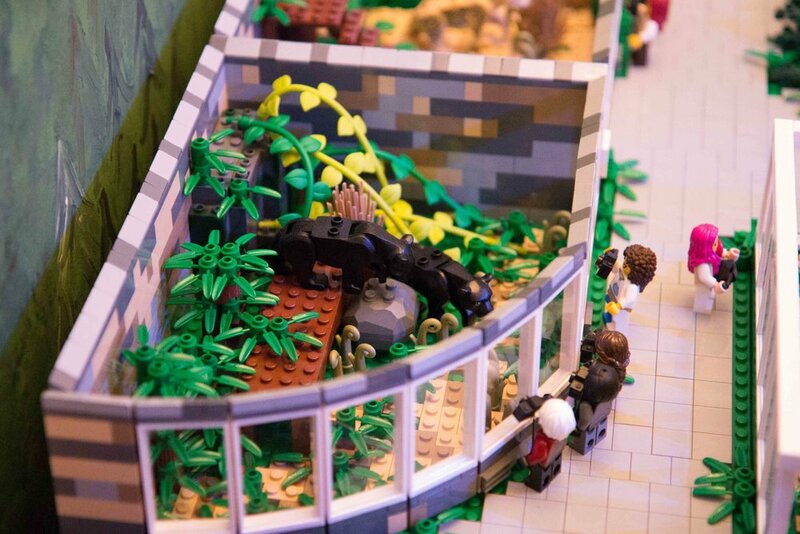 From a company or product launch event, or that all-important trade show in your calendar to a visitor-engagement event at your museum or attraction, a LEGO element can add so much. The National Museum of Scotland celebrated its 150th anniversary in 2016 coinciding with the Year of Innovation, Architecture and Design. LEGO bricks were the perfect medium to celebrate! They invited us to create an exhibition a large scale interactive build of an iconic museum artefact and construct a model of the museum itself, built live in front of museum visitors! With over 30 models on display, a 2 metre high public Big Build of the Berserker Lewis Chessman and a 90,000 piece centrepiece model, the collaboration lasted over 3 months and still remains hugely popular within the museum. One of the most iconic items in the collection are the the Lewis Chessmen. Discovered in 1831 on the Isle of Lewis, these 12th century pieces are known throughout the world. Building a Lewis Chessman in LEGO bricks seemed the ideal way to celebrate the exhibition. A 3D laser scan of the chessman was provided to Warren Elsmore by the museum which was used as the template for the design. Using in-house tools, we created a set of instructions that could be followed to create a 50cm high version in LEGO bricks. Using this template, we then scaled up the model to create a 'Big Build'. Each normal LEGO brick in our instructions was replaced with a section built by the public - 4 times longer, wider and taller. 2,000 bricks later (and some special sculpting by our own builders) and we created a 2 metre high version of The Berserker that stood in the museum for the duration of the exhibition. The centrepiece of the exhibition was the creation of a 3.5m long model of the National Museum itself. Built inside the museum, each week we added to the museum to replicate both the 150yr old facade and the modern extension. We included exhibits from dinosaurs to lighthouses and spark generators, a carefully selected variety of museum artefacts were added to the model, of course in minifigure-scale! Running throughout the 3 month event, a series of models were supplied to be displayed in the Grand Gallery of the museum. Working with the curators, we chose a selection of models spanning Warren Elsmore's books but combined into a series of themed cabinets. Custom made plinths were designed for each model and some were hung within the display cases to great effect. During the Olympics, a number of nations create Hospitality Houses to entertain their national tourists and promote the country. For the London 2102 Olympics, Visit Denmark wished to create a unique experience promoting the best of the country, which of course included LEGO! Working within a strictly-defined space and in conjunction with Visit Denmark, we created a 1:500 scale model of the Olympic park. This would be open to the public, 12 hours a day, for all 19 days of the Olympics. As well as the model itself, the LEGO company would produce the world's largest LEGO windmill that would promote renewable energy. The proposal included the building of the model, an artist on site for all 19 days and maintenance of the windmill model supplied by LEGO. The model was delivered and installed to a difficult site, and then removed again after the closing ceremony, both were carried out overnight to reduce congestion. A fully contained waterproof display was delivered, including Perspex canopies, staging and trim panels to a very high standard. The model itself fitted perfectly into the other elements of the Hospitality House and acted as a draw across London. Visitors were attracted to the 'LEGO model of the Olympics', but stayed at the venue for all of the offerings available. The Danish House was voted as the most successful hospitality house within London. There was significant print, TV and radio coverage throughout the event, from numerous nations world wide. Video footage was picked up by global websites such as Engadget.com, Eurosport and BBC worldwide. Warren Elsmore gave live interviews from the site and interacted with the public throughout the 19 days, including visits from members of the Danish Royal Family. Following on from the event, the model was re-located to the Paralympic GB headquarters for the period of the Paralympics, where it was viewed by all of the Paralympic GB team, plus their guests and UK VIPs including Royalty, the Prime Minister and Mayor of London. We tried to do this for about 5 years. While we might be based in Edinburgh, finding a venue we can take over in the busiest month of the year isn't easy. We came very close in 2015, but finally managed to make it happen during the Edinburgh Festival Fringe 2017. Explore Edinburgh and win tickets to Brick City - the backstage tour! For the whole month of August, Warren and the whole team worked on one BIG project - and invited the public to see us at work. We're often asked if people can come and visit us at our studio but sadly it's just not possible. So for one month only we packed up the whole studio and brought it Edinburghs' Royal Mile and the amazing Riddles Court. Brick City - the Backstage Tour gave over 9000 people the opportunity to see some how a firm of master builders put their models together. First, visitors came into the historic Edinburgh building to see some of our very favourite models. These models are the ones that we keep in our offices. The ones we like to be surrounded by. The ones too fragile to move. The ones we can't bear to lend out to people! Once you had a chance to look at our favourite models, it was time to enter our studio. Surrounded by tens of thousands of LEGO bricks - all meticulously arranged of course - you would meet our master builders. Warren, Kitty, Alastair, Guy, Rocco and Loic - working throughout August right in front of your eyes. Think you'd seen everything? The best part was still yet to come! Once you'd torn yourself away from the studio it was time to go downstairs to see the Brick City we constructed during the month. Just imagine what you could do with an almost unlimited amount of LEGO bricks and sets? The team spent all of August building an enormous city display. Featuring an airport, beach, funfair, racetrack and so much more - this was the ultimate LEGO city display! Since the games, the sculpture has become an icon of east London and is visible from miles around. Built using 2000 tonnes of donated steel by ArcelorMittal, the structure is comprised of hundreds of individual steel joints and beams. To celebrate the half term holidays, I was commissioned to not only bring an exhibition to the viewing gallery of the ArcelorMittal orbit but also to attempt to build the structure from LEGO bricks! The 'Bricks in the Sky' exhibition comprised a number of iconic London landmarks, famous worldwide structures and of course the London Olympics model build in 2012. Building the ArcelorMittal Orbit, live in front of the public over a period of 9 days turned out to be a particular challenge - as you can see from the videos below! Christie and Co provide brokerage and advisory services to the hospitality sector. For their stand at the International Hotel Investment Forum (IHIF), they wanted to create a spectacle that would be drive visitors to the stand but also generate engaging social media opportunities that could push their message much wider than the expo itself. Warren Elsmore created three LEGO models of hotels or buildings that Christie and Co had been involved in selling. These were the Le Meridien in Vienna, The Burj Al Arab, Dubai and The London Shard. The Le Meridien and Burj Al Arab would be pre-built off site and installed to the stand as part of the build. The Shard would be built on the stand itself during the event. The models were delivered to site and installed by the Warren Elsmore team, working closely with the exhibition contractor and PR agency. Working around a tight schedule, all of the models and LEGO pieces needed were installed and stored without impacting the rest of the stand. The Burj Al Arab model attracted a great deal of interest, and was widely shared by the conference organisers as well as visitors, on social media. The operators of the actual hotel commented on its accuracy! Building The Shard during the show also attracted a great deal of interest. Sections of the model were designed in advance, and the base pre-built, allowing the onsite team to finish on schedule in the middle of the last day. Two master builders were present every day to answer questions as well as complete the build. Once the event was finished, the master builders packed away the models and all building supplies, leaving the stand exactly as it was on arrival. The models themselves were transported back to the UK from Berlin by our own specialist vehicle. National Museum of Scotland - Build It!